Do these homemade meals live up to the hype? 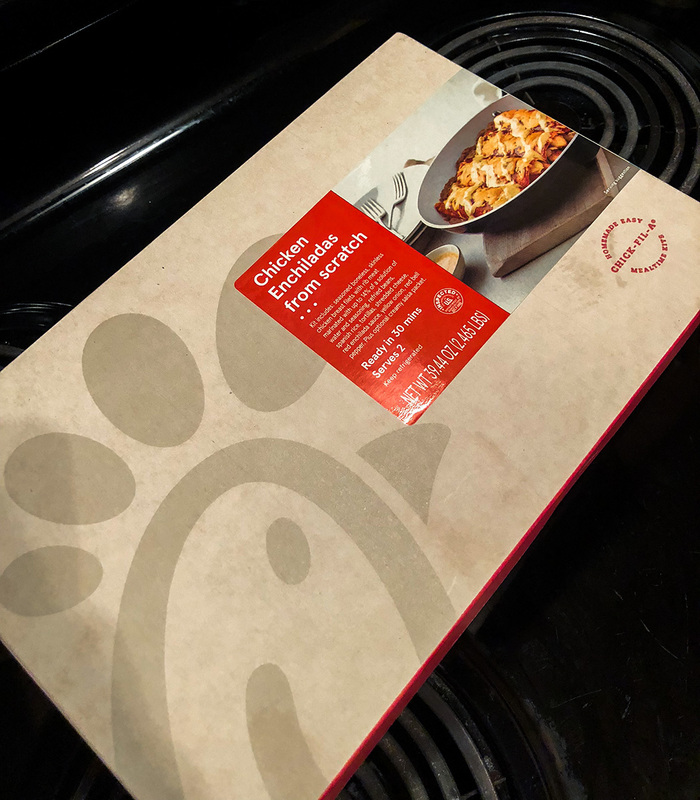 When Chick-fil-A announced in July that it would begin testing new take-home meal kits in its Atlanta markets, the internet went wild. What would the fast food restaurant’s version of Blue Apron taste like? Out-of-state fans jokingly (or maybe not) asked Atlanta relatives to mail them a kit. Chick-fil-A is toting these kits as a convenience. Stop by the drive-thru for a No. 1 meal and nuggets for the kids, and while you’re there, grab a couple of kits for a homemade dinner the next day. All of the kits contain the chain’s beloved chicken, and many include other ingredients associated with the restaurant, such as its salad dressings and sauces. While I bake cupcakes and cookies fairly often, I am not a cook. I can make simple dinners for myself, but show me something that involves having multiple things on the stove at the same time and I get flustered quick. I also work a lot and live minutes from a Chick-fil-A, so I seem like a star candidate for these meal kits. But after cooking it, the thing that surprised me the most was how it really wasn’t much easier to use the kit than it would be to make a similar dish with ingredients bought at Kroger. 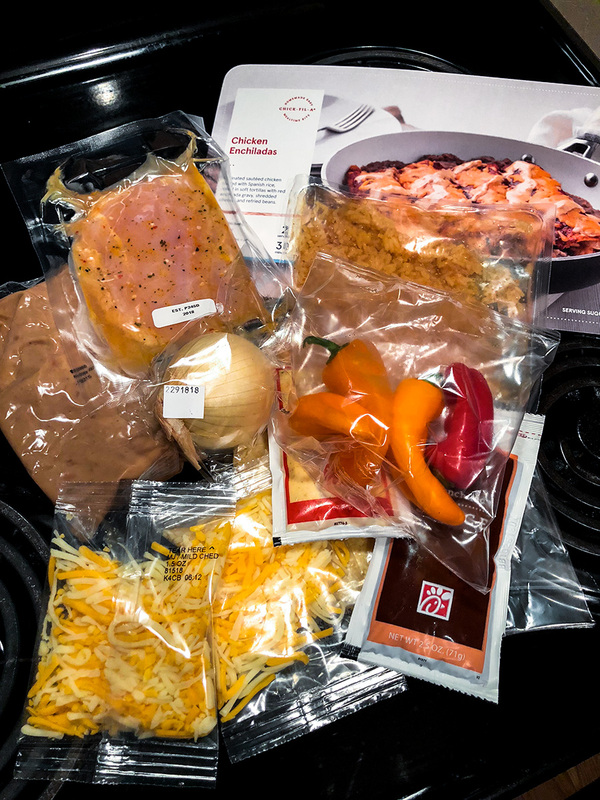 What’s inside the box of the enchilada meal kit. As with any meal kit, the individually packaged ingredients generate a ton of trash. While the little gray tray that holds the ingredients is compostable, the plastic ingredient bags are not. Environmental concerns aside, I have a tiny kitchen where excess waste adds up fast. Most of the packages did require scissors to open, so keep a pair handy. The instructions are pretty straightforward and don’t involve any complicated techniques. I do appreciate the tip to chop the ends off the whole white onion before peeling it—that’s easier than my go-to method of peeling, then chopping. But there are a few things that truly novice cooks might trip over. I don’t cook meat often, so I’m a horrible judge of when chicken is fully cooked. The meal kit listed the proper temperature, so I just grabbed a food thermometer and used that as my guide. But this isn’t necessarily an item someone who rarely cooks would own. 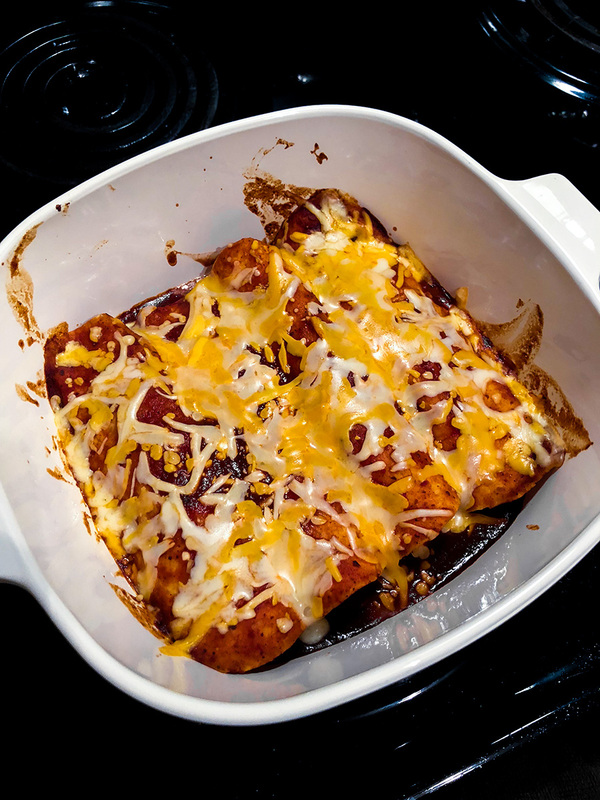 The most glaring omission was that there was no indication of how the enchiladas were supposed to look once they came out of the oven. Should the sauce bubble? What should the cheese look like? I just winged it and hoped for the best. It’s also advisable to use caution with suggested cook times. My chicken ended up sticking to the skillet because the suggested medium-high heat was too hot on my stovetop. The finished product, prior to drizzling Chick-fil-A’s creamy salsa dressing on top. 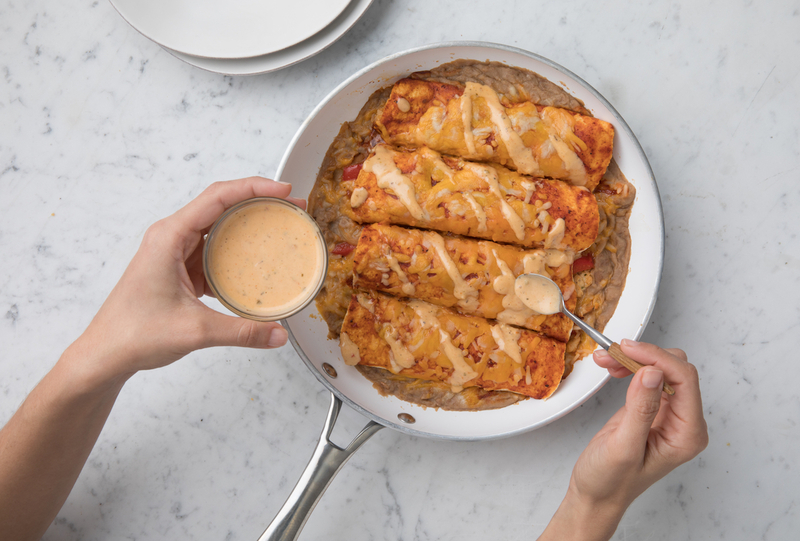 My enchiladas came out tasting essentially the same as when Chick-fil-A chef Stuart Tracy prepared them at a media preview at company’s headquarters last month, which was impressive given my lack of experience and the aforementioned chicken-sticking-to-the-skillet incident. But ultimately, the kit didn’t feel terribly convenient. Because this particular kit relies on a lot of ingredients that can be used straight out of the can or bag—refried beans, tortillas, enchilada sauce—the only thing that really saved time was the precooked rice. It took just under 90 minutes from the time I opened the kit to when I was plating dinner, and while I’m admittedly a slowpoke in the kitchen, it seems like a stretch that someone could make the kit in the suggested 30 minutes. Meal kits are great when they give you the opportunity to make something really complicated using obscure ingredients you wouldn’t have in your cupboard. I didn’t work with anything in this kit I hadn’t worked with before. Overall, the enchiladas were fine. They did taste kind of processed compared to something cooked truly from scratch (do yourself a favor and don’t look at the sodium and saturated fat levels on the nutrition label), but they are hearty—a serving is more than enough food for one person, making these handy for those who live alone. Each box serves two people, and one night of leftovers is much more manageable than six. The biggest asset is the chicken breast, which is without a doubt Chick-fil-A chicken and tastes like the meat you’d eat at the restaurant. It’s far better than chicken breast I’d make on my own, but that was really the only thing that tipped the scales for me. I do have more confidence in my ability to make enchiladas now, so the kit at least served as a decent teacher. 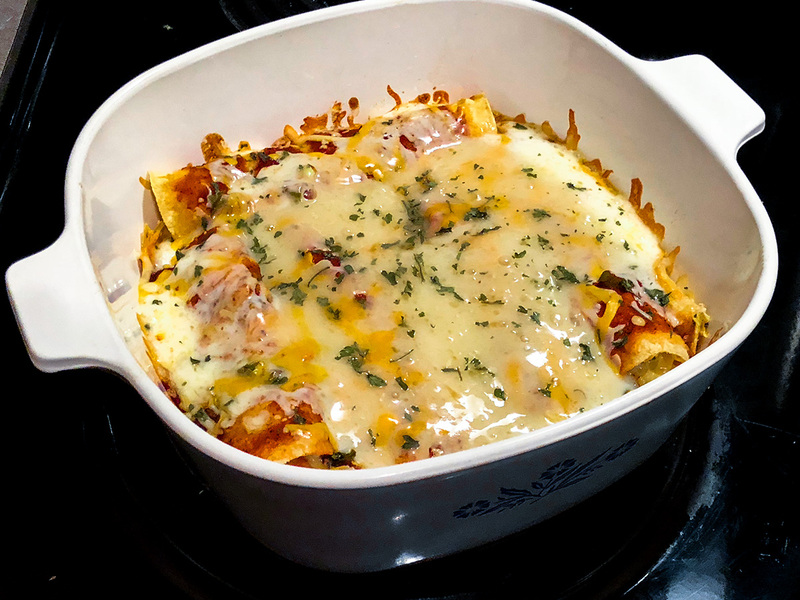 I’ve never attempted enchiladas before, so I found the meal kit appealing as a way to learn a new culinary skill. Having already tasted the enchiladas at the media preview, I’d identified a few things I wanted to improve before I attempted my kit. 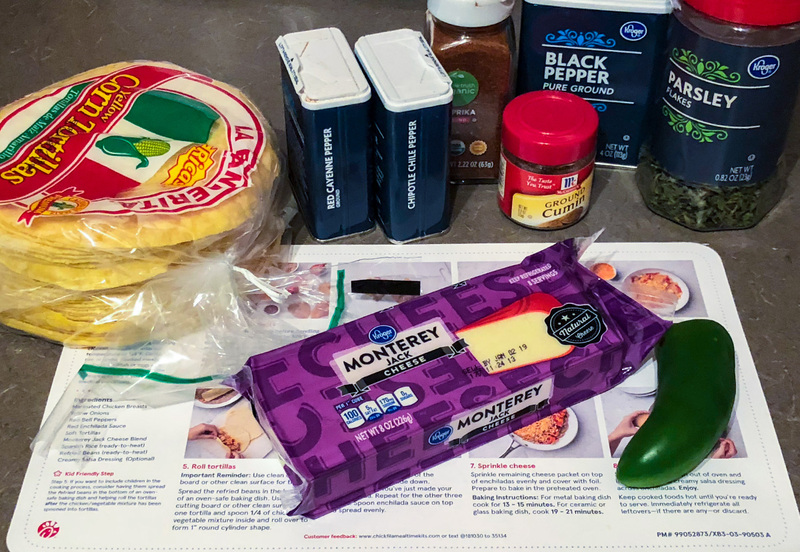 I spent an additional 15 minutes of prep time chopping a jalapeño pepper, grating additional Monterrey Jack cheese, and preparing a spice mixture of black pepper, cumin, cayenne, chipotle chili powder, parsley, and paprika to boost the flavors already present in the dish. I also decided on adding additional corn tortillas (the kit arrives with flour), since I knew that I’d be creating more filling by going off-book. The extra ingredients our experienced home cook added to his meal kit. I think most people, regardless of their comfort in the kitchen, would be able to follow this meal kit’s recipe. The entire process (including the aforementioned prep time) took 90 minutes. I wasn’t impressed with the quality of the kit’s bell peppers; if I were shopping at the grocery store, these wouldn’t have made my cut. They were just a bit too squishy and small. The real strength of Chick-Fil-A’s meal kits lies with its chicken, as it’s the same supply used in restaurant. It comes prebrined and seasoned accordingly for the kit, allowing anyone to make something tasty with little additional effort. The kit’s seasoning is meant to be a crowd-pleaser: not too spicy and not too bland. I punched it up with my spice mix, adding some preferred heat. The chicken and veggies are fully cooked on the stove before they are rolled into tortillas and baked. 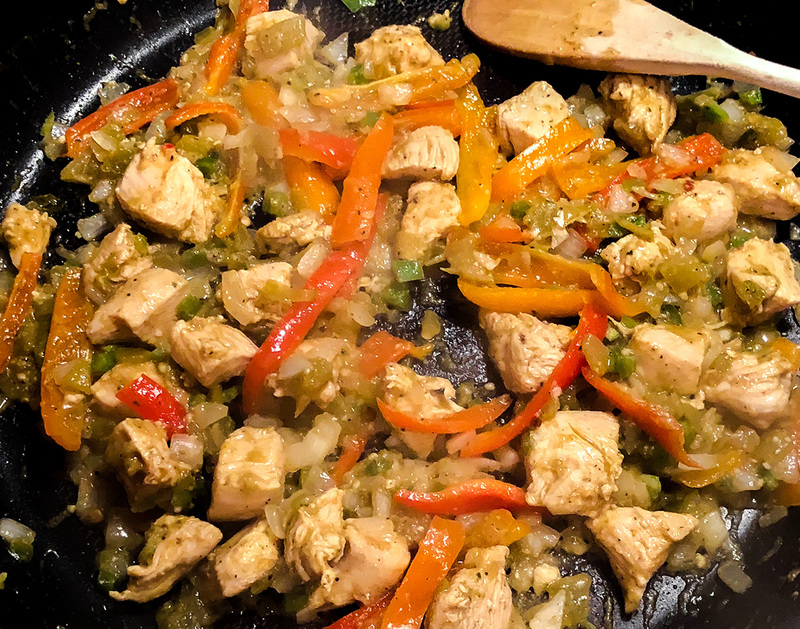 Aside from my slight modifications, I followed the cooking directions to the letter, adding in the extra jalapeño and green chilies with the kit’s peppers, onions, and chicken. Some of my extra cheese went into the filling mixture, and some went on top when the enchiladas baked in the oven, similar to the kit’s original instructions. The extra corn tortillas came in handy—my additions yielded enough filling for five extra enchiladas. My $6.00 of supplemental ingredients turned the two-serving kit into a meal that could easily feed three to four people. At the end of the day, I just don’t feel like I’m the type of person who’s going to get a lot out of Chick-Fil-A’s—or anyone’s—meal kits. But I’m glad I walked away knowing how to make a new dish. That’s the best part about this type of cooking—it teaches you the basics of crafting a new meal. 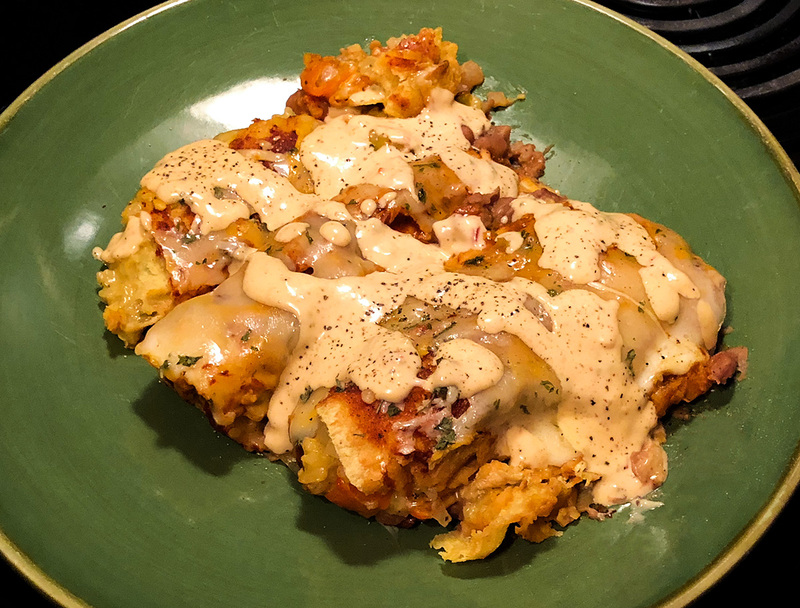 Next time I want enchiladas, I know roughly how to do it, and with a little Googling for recipes that approximate the enchilada sauce and creamy salsa dressing, I think I can replicate what I made.